Want More Internal Resources When Dealing With Your Kids? For the last few weeks, I have been sharing information on the value of seeing situations in our lives in a more positive light. It requires that we let go of blame, fear, anger and so forth. But that takes some practice. So why would we even want to do it? 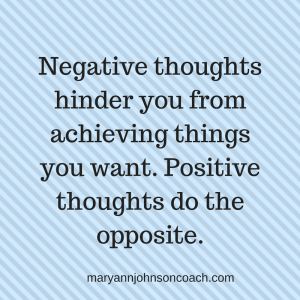 Negative thoughts hinder you from achieving things you want but research has shown that positive thoughts do the opposite. Barbara Fredrickson is a positive psychology researcher at the University of North Carolina. She’s been able to demonstrate that positive thoughts can create real value in your life. She took five groups of people and showed each group film clips. Two groups saw clips of joyful things or sights that engendered contentment. Two groups saw clips which brought forth feeling of fear or anger. The control group saw neutral images. Afterward, each participant was asked to imagine themselves in a situation where similar feelings would arise and to write down what they would do. Participants who saw images of fear and anger wrote down the fewest responses. Meanwhile, the participants who saw images of joy and contentment wrote down a significantly higher number of actions that they would take, even when compared to the neutral group. 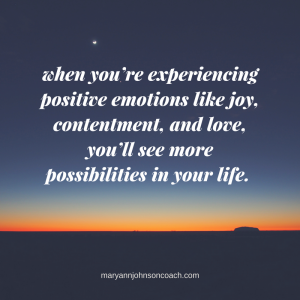 In other words, when you’re experiencing positive emotions like joy, contentment, and love you’ll see more possibilities in your life. Your thoughts will be more positive. That means the truths you embrace or the stories you tell yourself will be more positive. That will help you see more options for response. I was mentoring a self-employed mother who was telling herself a negative story about her son’s actions. She felt he was whiny and needy. He was a bother when she was trying to work. Her responses to her son were causing a strained relationship between them. She was having difficulty figuring out how to fix the situation. Here’s what happened when she began telling herself a more positive story. When I asked her to tell me more about her son, she replied that he was bright, loving, and responsible. So she decided to remind herself of these qualities each time she began to experience annoyance or frustration rather than think about his whining. When her story was negative, she had fewer ideas on how she could deal with the situation in positive ways and, in fact, dealt with her son in more negative ways. This set up a negative cycle between them. Her son tried harder to be heard and seen, her annoyance was heightened, and she responded in more negative ways. Her son would try even harder to be heard and seen, and the cycle would repeat. When she changed her story and generated more positive feelings, she found more creative ways to respond. The new responses changed the dynamic or cycle with her son. This mom got better results because her feelings were positive. Her feelings were positive because she changed her story about her son. She found ways to be Present despite her work or his needs. Remember that every situation and experience is made up of multiple truths. When we choose to focus on the more positive aspects of what happens in our lives we will be able to be Present more often and more consistently which will help us have happier family experiences. That’s why it’s worth the work and practice to take control of our thoughts, feelings, and the resulting stories. We will be able to respond better, even in negative situations. And that will get us a better result! Have you had an experience where changing your story about a person or situation has changed your ability to respond well? Man, I really want to hear about it! Please share in the comments section.